Up until recently I had never ate a Nakd Bar, I had seen them in my local store, But I had never purchased one. In my mind it was a healthy bar which probably wasn't that tasty, So when I had the opportunity to try some, I was intrigued and very pleasantly surprised. 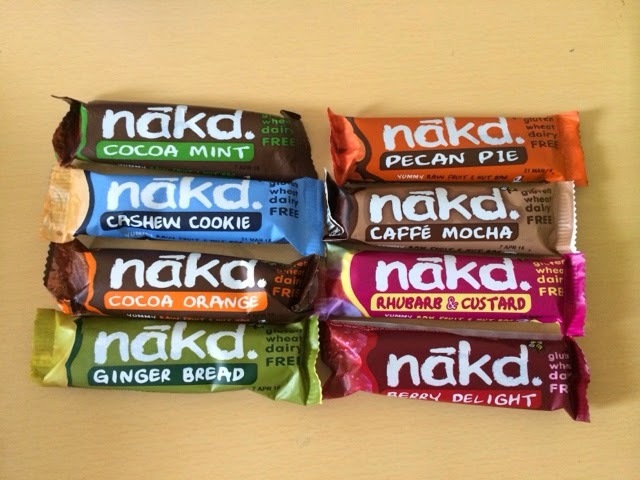 Nakd bars are delicious snacks bars made with raw fruits and nuts containing 100% natural ingredients with no added sugar or syrup, all of the Nakd bars are wheat and dairy free. The Nakd bars are soft and chewy and are great for on the go, and as a snack. 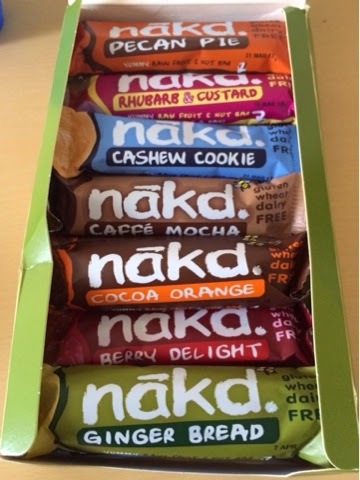 The Nakd bars tasted sweet from the fruit and I really enjoyed every bite, they were the perfect snack. Nakd bars are delicious I cant believe I have missed out all this time. My favourite has to be this tasty Cocoa Delight - I'm a huge chocolate fan so this one was perfect for me, it tasted rich and chocolaty with a hint of cashew nuts and is made for 100% natural ingredients. Cocoa Delight - Chocolaty and simply delicious. Cocoa Mint - Cocoa with a hint of Mint, soft and very tasty. Peacan Pie - crunchy pecans with delicious dates. Cashew Cookie - Tasty and very nutty, delicious. Caffe Mocha - A tasty infused taste of cappuccino and cocoa. Cocoa Orange - delicious chocolate flavour with a zing of orange zest flavour. Rhubarb & Custard - A scrumptious taste of smooth custard with a rhubarb taste. Ginger Bread - delightful soft with a nutty bite, with a subtle ginger bread taste. Nakd are produced by Natural Balance Foods a British company devoted to making tasty healthy snacks and protein bars as well as a varied range of natural products including flapjacks. I was given the Nakd Bars to sample, all views are that of my own. And I remain honest in my opinions.